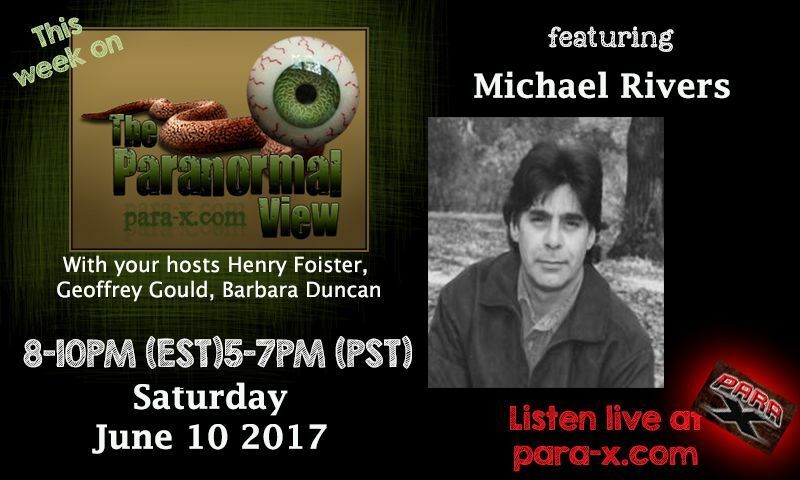 Tonight's guest was author and paranormal investigator Micheal Rivers. Henry started right in Michael's Appalachia Mountain Folklore book, many of which on superstitions, not all ghostly stories; an intermingling of the settlers and the native Americans. Michael spoke about an investigation on which he went, with a Portal, at one point suddenly sending a massive static charge, enough to create an ozone smell. One person was able to see Into the Portal, similar to a large grey hallway, sounding along the lines of the Untempered Schism. Michael spoke about some of his investigation techniques and equipment, including but not limited to the classic Olympus digital recorder, as well as the sensitive. bi-aural recorder. Henry asked about Michael's story about Moon Eyed People, which seemed to be subterranean. Coming back from the first break, Ceiling Cat Barbara Duncan reported we had listeners tonight in the US, the UK, Australia, Japan, Ireland, Canada, and Unknown. CC asked about the Snow Witch story, a parental standard to scaring children into behaving, similar tk\o Krampus. Henry asked about village of Blowing Rock, and a Romeo and Juliet situation between two Native Americans of different tribes, and the Devil's Staircase. Henry asked about the famous, centuries-reported Brown Mountain Lights, which Micheal explained, debunking the ludicrously varied standard-lies provided by the government, who can't otherwise explain them (many of which were modernized theories despite the lights being sighted for centuries before what would corroberate their theory existed). During this, Skype dropped me from the call. By the time I got back, Henry asked about the Green River Plantataion near Lake Lure, and Chimney Rock. Michael spoke of detecting thirteen spectral entities at a nearby investigation. a few of the spirits were able to communicate via a flashlight in the hand of a broken Teddy Ruxpin, which at the time had no batteries insalled. He spoke of upcoming books of his, being written under his birth name M.D. Baugham; his non-de plume author name is in honour of his Native American grandfather. Out of time, Henry quickly conveyed the following week our guest would be author Nick Redfern, of 365 Days of UFOs, Women In Black, et al. The Smokey Mountain Ghost Trackers on Facebook.